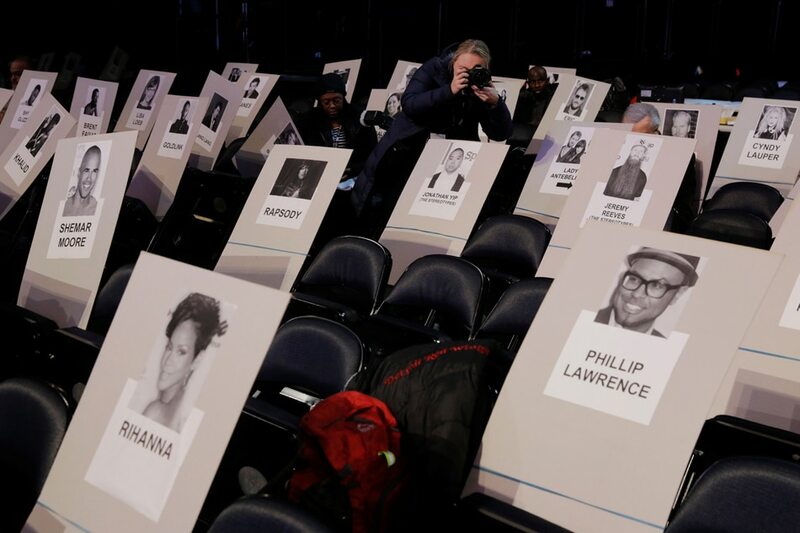 NEW YORK -- Lady Gaga, U2, Cardi B, Pink, Miley Cyrus, Sting, Elton John and Sam Smith are just a few of the artists due to perform at the Grammy Awards on Sunday in a 60th anniversary celebration of music across the board. But like many of the major U.S. award shows this year, entertainment and trophies won't be the only matters on the minds of performers. Artists are expected to wear white roses as a symbol of solidarity with victims of sexual harassment as the #MeToo movement spreads from Hollywood to the music industry. "You'll hear individual comments from artist who are there. That's really what it's about and we welcome that," said Recording Academy president Neil Portnow. Kesha, a best pop vocal album nominee who has been battling her former record producer Dr. Luke for years in U.S. courts over allegations of emotional and sexual abuse, is expected to perform her emotional single "Praying" with Cyndi Lauper, Julia Michaels and a full choir. Dr. Luke has repeatedly denied Kesha's allegations. "i'm so proud and nervous and overwhelmed to be performing it at the grammys on sunday, and if you need it i hope this song finds you," Kesha tweeted on Saturday. Grammy nominees Alessia Cara, Khalid and Logic will take the stage with a group of suicide survivors to perform their song "1-800-273-8255," the telephone number of the National Suicide Prevention hotline. And country artists Brothers Osborne, Eric Church and Maren Morris, who appeared at the Las Vegas country music festival where 51 people and more than 500 were wounded last October, will mark the victims of gun violence and extremist attacks at music events. Rapper Jay-Z goes into Sunday's awards show with a leading eight nominations, mostly from his soul-baring "4:44" album. He faces Kendrick Lamar, Bruno Mars, Childish Gambino and New Zealand-born singer-songwriter Lorde to see whether hip-hop can break a 14-year dry spell and win the top prize of album of the year. Mars, Jay-Z, Lamar and Gambino are also nominated for record of the year, but so too is Latin dance hit "Despacito" by Luis Fonsi, Daddy Yankee and featuring Justin Bieber. The single last summer broke records as the most-streamed global track of all time, with more than 4.6 billion plays across leading platforms. Ross Scarano, vice president of content at Billboard magazine, gave "Despacito" the edge. "It appealed to a lot of people. It also speaks to the more global sound of pop this year, the emphasis on Latin music," Scarano told Reuters. The Grammy Awards will be broadcast live on CBS television in a ceremony hosted by James Corden from New York City starting at 7:30 pm ET. Following is a list of nominees in key categories. "Despacito" - Ramón Ayala Rodriguez, Justin Bieber, Jason "Poo Bear" Boyd, Erika Ender, Luis Fonsi & Marty James Garton Jr.